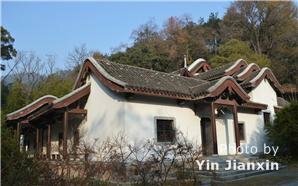 Yuelu Academy was among the four ancient Chinese academies along with Bailudong Academy on Lushan Mountain of Jiangxi Province, Yingtianfu Academy in Shangqiu of Henan Province and Songyang Academy in Kaifeng of Henan Province. It was built by Zhu Dong, the governor of Tanzhou (presently named Changsha), in the 9th year (976) of the Kaibao period of the Northern Song Dynasty (960-1127), and it continued to develop during the Southern Song Dynasty (1127-1279), the Yuan Dynasty (1271-1368), the Ming Dynasty (1368-1644) and the Qing Dynasty (1644-1911). Yuelu Academy was converted into the Hunan Institute of Higher Learning in 1903, the Hunan Normal College and the Hunan Public Polytechnic School in succession. It was finally named Hunan University in 1926, and it was listed among the key cultural relics under China&apos;s state protection in 1988 owing to its perfect combination of natural scenery and manmade landscapes. With an area of 21,000 square meters, Hunan Yuelu Academy nestles at the foot of Yuelu Mountain in an elegant style, where the architectural buildings are distributed along the central axis, including the Entrance Gate, Hexi Terrace, the Main Gate, the Second Gate, the Lecture Hall and the Imperial Book Tower. The sides of the central axis of Yuelu Academy are flanked with the Teaching Studio, the Xiangshui Scripture-Checking Hall, the Hundred-Spring (Baiquanxuan) Pavilion, the Chuanshan Memorial Hall, the Chongdao Memorial Hall, the Confucian Temple, the Six Men of Honor Memorial Hall and the Lianxi Memorial Hall. The Entrance Gate is crowned by a flush-gable roof with a single eave, over which an inscribed tablet hangs, and it reads &apos;the Thousand-Year Old Academy&apos;. As you walk past the Entrance Gate, the Hexi Terrace is before your eyes with a Chinese character for ‘Happiness and Longevity’, on the left wall and right wall respectively. The Main Gate is just behind the Hexi Terrace, over which an inscribed tablet of "Yuelu Academy" (written by Emperor Zhenzong of the Song Dynasty) hangs. Walk past a courtyard from the Main Gate, and you will reach the Second Gate. Behind the Second Gate stands the Lecture Hall which was the very site for presidents of the academy to give lectures during the Song Dynasty (960-1279) and the Qing Dynasty (1644-1911), where important events were also held. 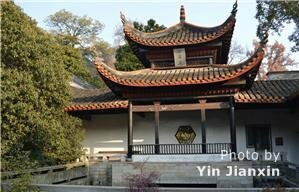 In the center of the Lecture Hall stands a lecture platform, on which the famous Neo-Confucian master, Zhu Xi, of the Southern Song Dynasty (1127-1279) stood to give lectures. On the left and right walls of the Lecture Hall are steles, on which four large Chinese characters (written by Zhu Xi) for &apos;Loyalty, Piety, Incorruption and Integrity&apos; are carved. Behind the lecture platform is a screen, on which the Record of Yuelu Academy, written by Zhang Mushi (1133-1180), is carved. To the north of the Lecture Hall stands the Xiangshui Scripture-Checking Hall. Behind the Lecture Hall is the Imperial Book Tower, and it has double eaves decorated with yellow glazed tiles.